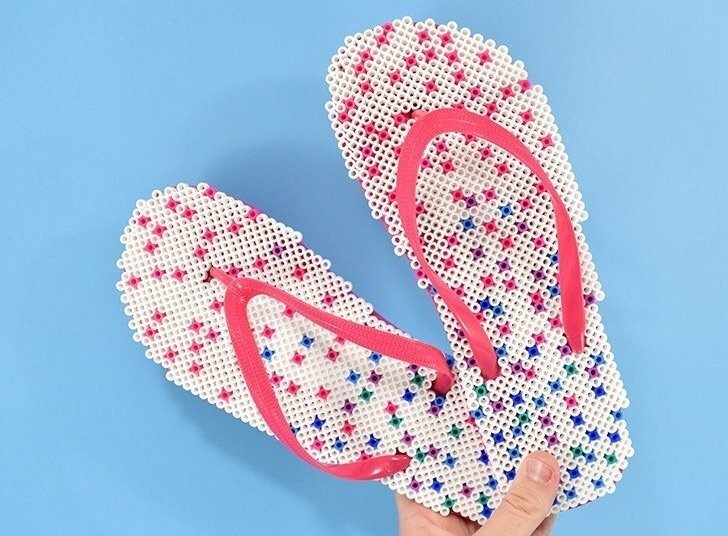 Grab the bucket of Perler Beads and a pair of cheap flip flops to make the cutest and most unique summer footwear on the block! 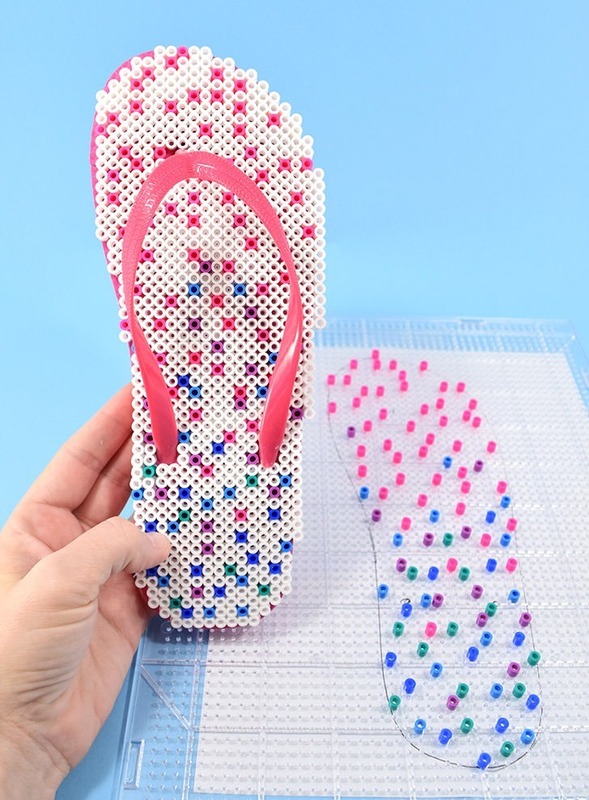 Perler bead flip flops! They had a huge sale on flip flops at Michael’s where they were a buck a pair and I went and stocked the heck up. It turned out that for everyday wear they’re a bit thin and so I decided to craft with them and see what I could come up. With such a large amount of flip flops to craft with, it was inevitable, I think, that I’d come up with something that is way off the beaten path when it comes to shoe makeovers. Trying to figure out ways I could update the soles I thought it would be pretty darn cool to cover them with Perler or Hama beads. I have so many Perler beads that it’s just nuts. And thinking I didn’t have enough white Perler beads I purchased a bag of SIX THOUSAND white Perler beads to use for this project. Because, apparently, I have gigantic feet that I’d need SIX THOUSAND Perler beads to create soles big enough to rest on top of. Jeesh. Now I know what you’re thinking because Rob has said it aloud like 5 times now. 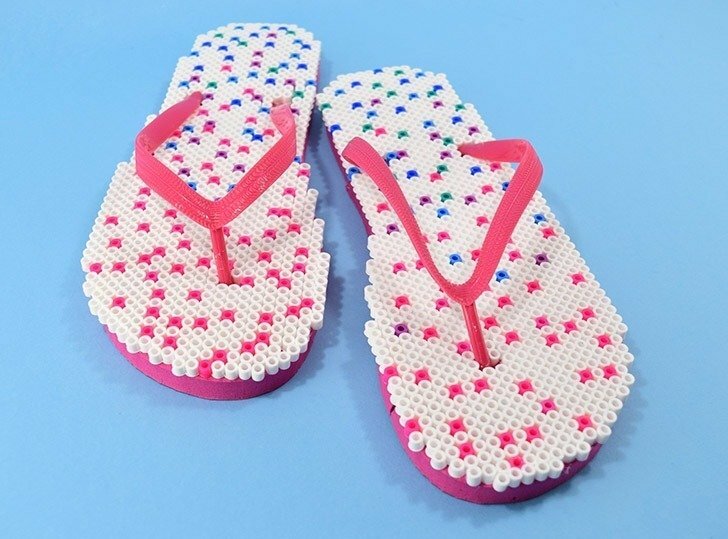 Can Perler bead flip flops really be comfortable? I’m going to tell you a little secret here. I accidentally made these a whole size smaller than what I normally wear. As I was working on the darn things I actually started to wonder why I always felt my feet were so big. This isn’t so bad. But it turns out it isn’t my size :) In spite of that, I decided that it was imperative that I wear these suckers around for at least one full day so I could honestly say if they are “wearable” or not. Because I mean, kids will wear some things that are on the edge of comfort if it’s something cool enough looking or something they made, but what if you’re just a Perler bead loving adult? While not the most comfortable of sandals I’ve ever worn, I have to say they aren’t bad, either. I used to have this pair of Crocs flip flops that my mom got me and the soles were super textured and they feel a lot like that. After I got used to the soles on my Crocs not being smooth I didn’t mind the texture. This is kind of the same way, but the Perler beads aren’t even quite a textured as those Crocs were, so that’s a win in my book. Because of the extra height of the sole the straps are a bit tight. But I used cheap flip flops from Michael’s and during the day the rubber started to compress and they got to be just fine within a few hours of wear (and I mostly sit around, really). So go with cheapies to start with and you’ll be set. In my opinion, these suckers are totally wearable and totally cute. And when you go to the craft store in them, you’re probably going to get a lot of compliments. I mean a lot. And maybe one or two people will tell you they’re too small, but who cares what they think?! If you already have a crafty stash, you’re very likely to have everything you need. Except maybe for the Perler beads. 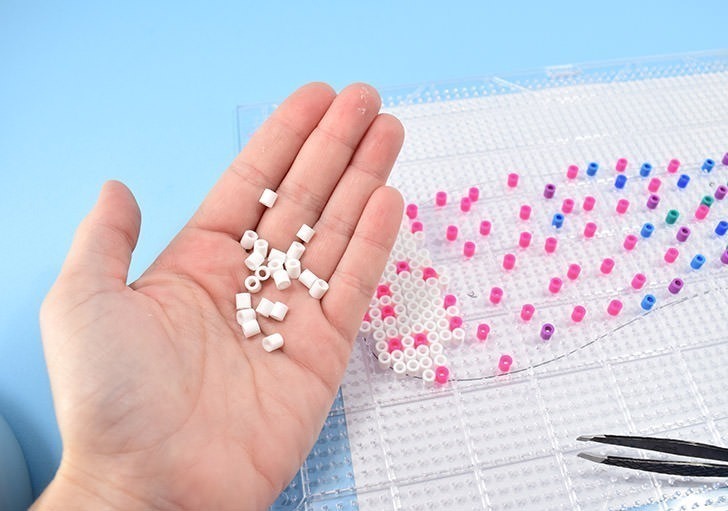 But you can wrangle up a bucket of 22,000 of Perler beads for less than $17 and make, like a bazillion crafts with them. And if you have kids, they go nuts for Perler beads. Plus it keeps them super focused and busy. And that means out of your hair for a little while. That’s largely why I have so many Perler beads around here. When I need a break or to get some work done, I’ll toss some beads and pegboards and patterns in front of the kiddos and check in on them every once in a while to make sure everything is copacetic. It always is. And then when I iron their beads into place, they’re always so proud of what they’ve made. There is something truly satisfying about making something out of melty beads and around here, we just love it. But enough gabbing, let’s start working. 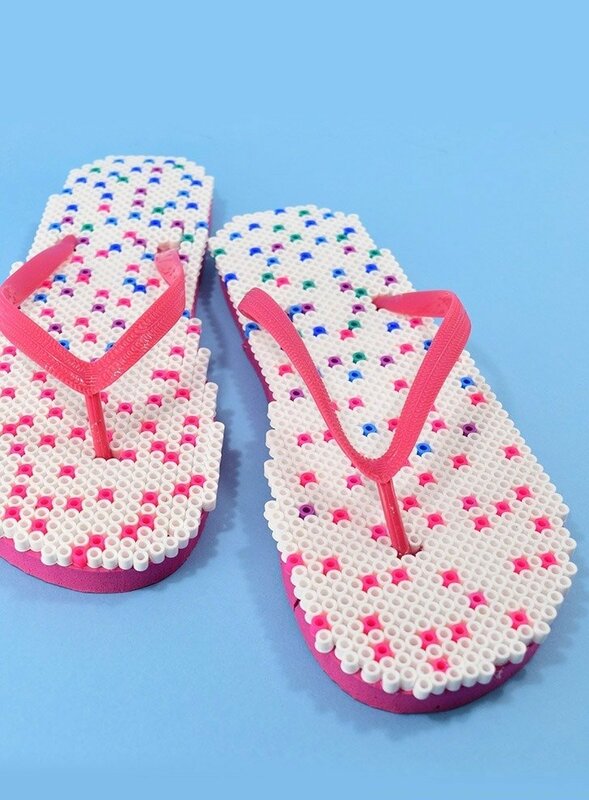 Let’s make a pair of Perler Bead Flip flops, shall we? 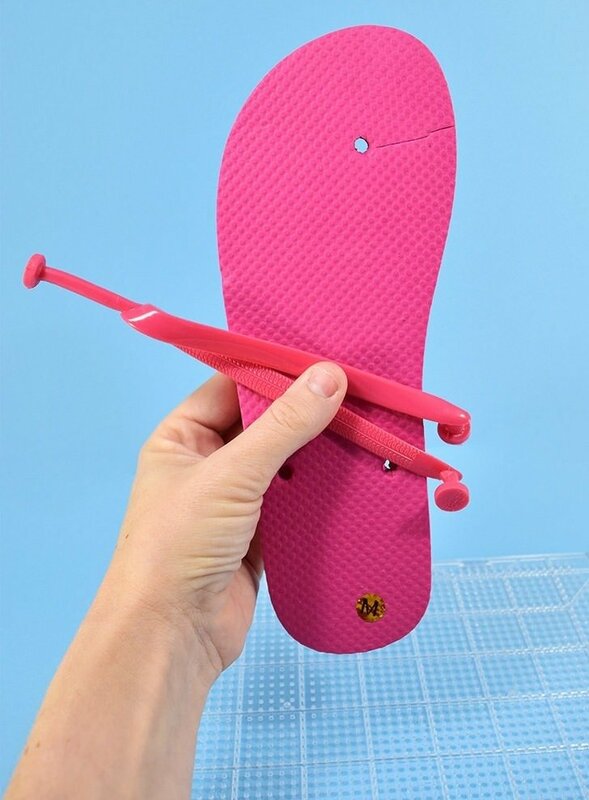 Remove your flip flop straps from the rubber sole. Now, when the idea for Perler bead flip flops came to me I figured that I would use a sole made solely of beads. See what I did there? :) But as I ironed to join my first shoe sole made of nothing but beads I realized something… this is not going to be thick or strong enough to hold the thong straps. Oh, and it’s going to be crazy uncomfortable to wear and I NEEDED those rubber soles for some needed height, strength and cushion. Planning on tossing the rubber soles, I didn’t take much care with them, but I’d strongly suggest you remove your straps much more gently. I tried on a few pairs, now, and I couldn’t seem to remove the straps without SOME kind of cutting. When slicing through the rubber sole try to create a nice straight and even line from the hole to the edge in a way that the cut is as short as it can be so you can also keep the integrity of the sole intact as much as possible. One a piece of scrap paper trace the outer edge of your sole and then mark the holes for the thong placement. 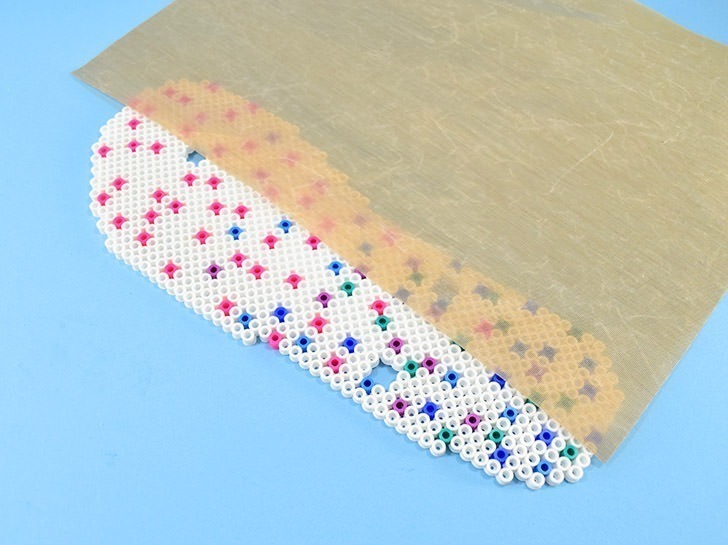 Tape the paper to the underside of an amply sized Perler pegboard. Decide what kind of pattern you want on the soles of your shoes. I decided I wanted a rainbow ombre thing where the soles are mostly white. 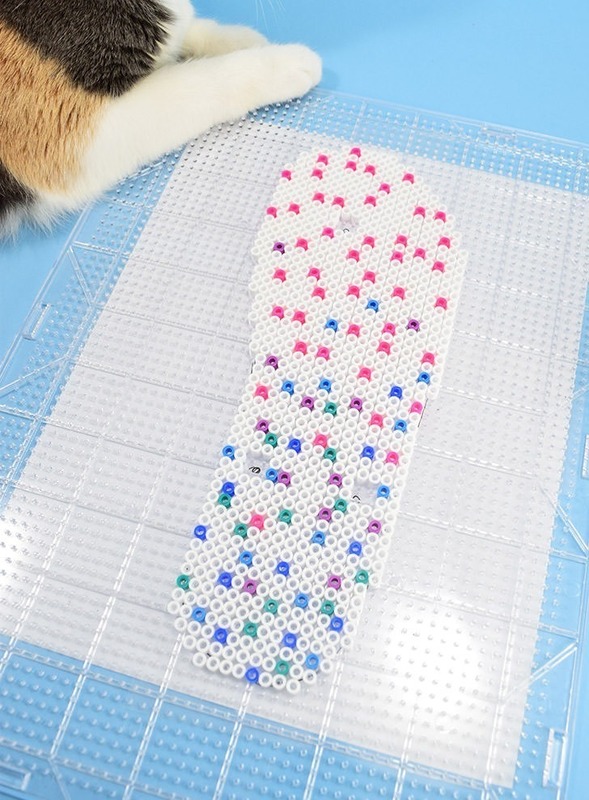 Using whatever tool you are most comfortable with, fill the shape of the sole per your paper guide below, following around the edges and leaving a 4×4 bead area clear for each of the thong attachment areas. I often will use a pair of old tweezers that no longer work for other stuff but my favorite way to work quickly is by loading up a toothpick and then sliding the beads onto pegs individually. It’s super fast. Once your design is filled turn your iron onto the appropriate setting and iron the beads into place, making sure to use a protective sheet on top to keep from ruining your iron. While the piece is still warm, but not too hot to handle, run the thong pieces through the appropriate holes with the melted side DOWN. 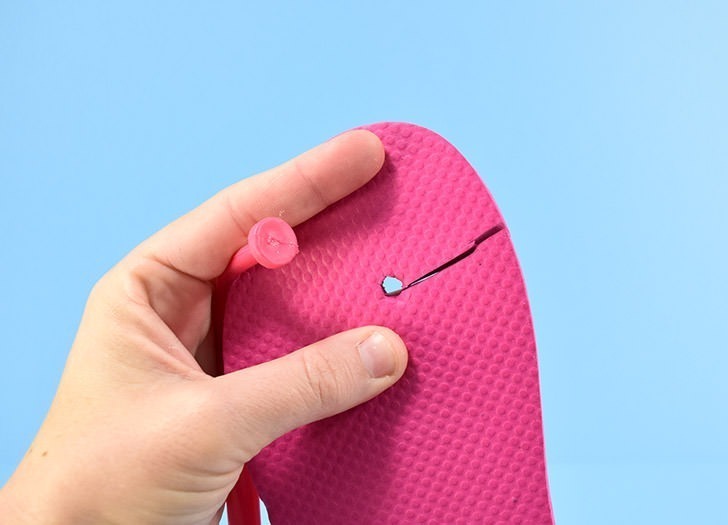 Now technically this means that while we were beading this looked like the right flip flop, but now that it’s being put together, it’s actually the left. And though we used the right flip flop to trace the shape, you’re going to need to grab the left rubber sole and apply a healthy amount of glue to the TOP of that sole. This step is a freaking bear. 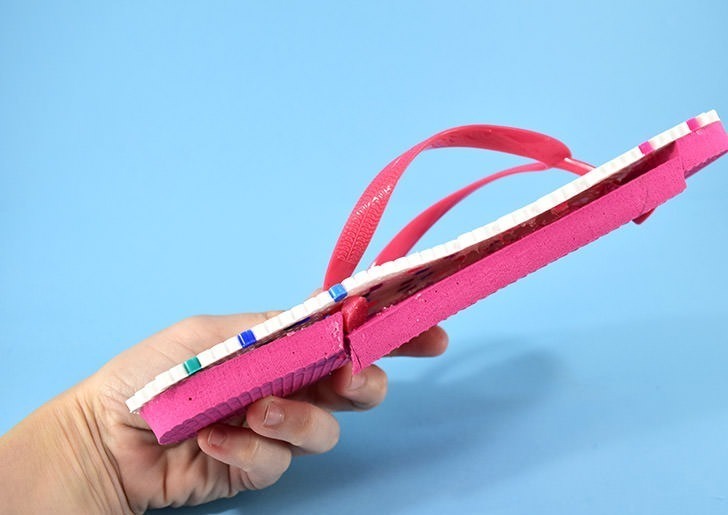 Technically the shoes have another quarter of an inch or whatever and your straps weren’t quite built for it, but if you pull and work it, you can get those strap thongs to run all the way through the bottom of the sole. But it can be done and it will be done. Just remember to take care of the glue sandwiched in between the 2 layers of your sole so you don’t make a big mess. Once everything is in place apply a healthy dose of glue into the cuts on your rubber sole and hold them until they start to stick together. 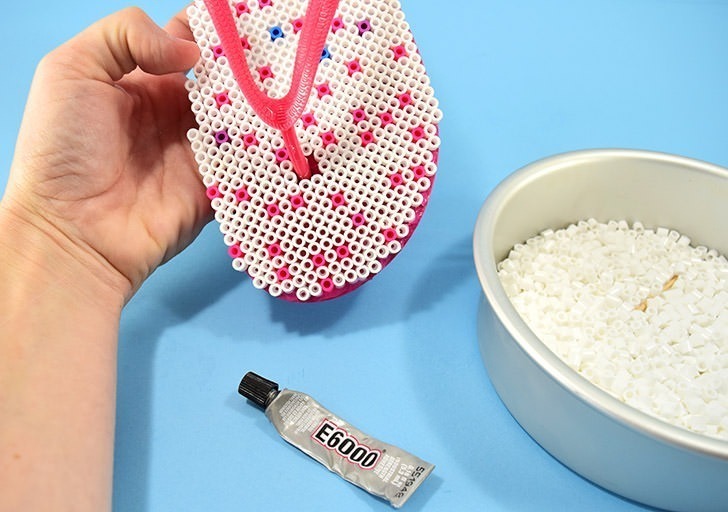 Next, use your strong glue and individual beads to fill in any very obviously empty places along the edge of your shoes. When making the second shoe of your pair, reference the first to ensure they match like, you know, a pair. On onee of my flip flops you can really see those seams where I kind of went a little nuts tearing those straps out. With more careful cutting and gluing while finishing, those won’t be nearly as visible as mine. 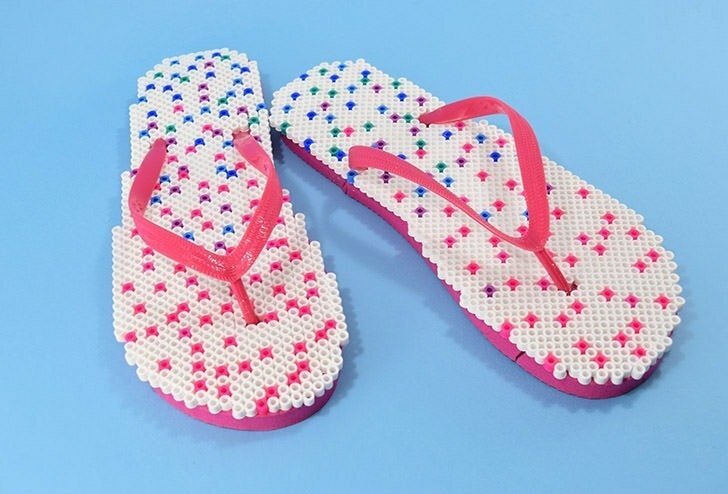 After the glue has dried, your incredibly neat and unique and moderately comfortable Perler bead flip flops are ready for a day out on the town!